Condoleezza Rice is a leading expert on the politics and military of Eastern Europe, the former Soviet Union, and other areas of the world. In 2001 President George W. Bush (1946–) named Rice his national security advisor, a key advisor and player in foreign affairs. She became the first African American and the first woman ever to hold the position. 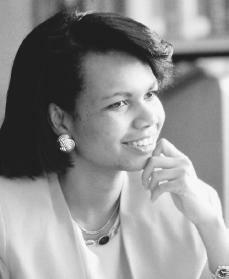 Condoleezza Rice was born in Birmingham, Alabama, on November 14, 1954. Condi, as she was known to her friends, was born into a family of educators. Both of her parents were teachers. In fact, Rice traces her career choice to her family's political discussions when she was growing up. Her parents also encouraged academic achievement, telling her she could "do and be whatever [she] wanted," Rice told Ebony magazine. She succeeded in many activities from an early age. She took piano lessons at three years old and was playing Bach and Beethoven before her feet reached the pedals. She studied figure skating, French, and Spanish. She entered the eighth grade at only eleven years of age, and graduated from high school at age fifteen. Rice then entered the University of Denver, first studying piano but later switching to political science when she realized she would never be a great pianist. She graduated with high honors when she was nineteen. Later, she returned to the University of Denver to study international studies in graduate school, earning a doctorate degree. In 1981 Rice started teaching political science at Stanford University in California. She focused on the politics of the Soviet Union and Eastern Europe, publishing articles and addressing audiences on these subjects. Through her writing, teaching, and public speaking, she became well known as an expert on the politics of the Soviet Union. With Alexander Dallin, she wrote Uncertain Allegiance: The Soviet Union and the Czechoslovak Army (1984). With Phillip Zelikow, she wrote The Gorbachev Era (1986). In 1986 she also served as special assistant to the Joint Chiefs of Staff, a group of leaders in the U.S. military who advise the president in matters of war. The following year she traveled to Bulgaria to speak to Soviet representatives about controlling the spread of weapons. In 1989 Rice was named director of Soviet and East European affairs on the National Security Council. In this position, she analyzed and explained to President George Bush (1924–) the events of international importance occurring in the region. She helped Bush prepare for summit meetings with then-Soviet president Mikhail Gorbachev (1931–) and other top officials. The purpose of the meetings was to create a plan for peace around the world. Much of the talk was about controlling the spread of weapons. The leaders also discussed expanding trade and the independence movements in many of the Soviet Union republics. As an advisor for Bush, Rice had important knowledge to provide about the politics and military abilities in that region. This work was exciting but challenging for her. In an interview with San Francisco: The Magazine, she said that the hardest part was remaining objective and "keeping the analyst in me separate from my political views." Rice told Ebony magazine it was a "truly amazing time to be working in the White House," because so much was changing in the Eastern-bloc countries. The Berlin Wall, which was erected between East and West Berlin by the Communist government of East Germany in 1961, had come down, allowing citizens of the East to move freely to the West. Shortly thereafter, the world witnessed the fall of the Soviet Union. affairs. She also contributed editorials and work to Time magazine and newspapers such as the Los Angeles Times. She continues to publish her scholarly work. In 1991 the thirty-seven-year-old Rice was appointed by the governor of California to a special committee to draw new state legislative and congressional districts in the state. She was the youngest member chosen. The governor told the Los Angeles Times that all the members shared certain characteristics. "All are distinguished scholars. All are leaders in their fields, known for [fairness] and devoted to the truth." Other people agreed with this opinion of Rice. In 1991 two major companies elected Rice to their boards of directors. She was named provost of Stanford, a very high-ranking position. After many years back in university life, Rice was asked to help George W. Bush run for president in 2000. When he was elected, he named her national security advisor. She was chosen for her vast experience and expertise but also because she was a trusted friend of George W. Bush. This combination of expertise and exceptional trust became especially important during the fall of 2001. Following the attacks of September 11, 2001, Rice became more important at the national and international levels. In the war in Afghanistan, Rice was a strong supporter of President Bush's actions and a trusted advisor in the conflict. In press conferences and on television news programs, she denounced the actions of the Taliban, Osama bin Laden (1957–), and the terrorist group al-Qaida. In Washington on November 8, she said, "What we are engaged in now is an act of self-defense to try to root out al-Qaida, to try to deny them safe harbor." She also has spoken forcefully about the U.S. military action and policies to fight the War on Terror. Rice has been fortunate, but she has also encountered her share of racism (a dislike or disrespect of someone solely because of the color of his or her skin). In high school she took difficult classes and had high grades. Her counselor, though, told her she was not suited for college. Rice told Ebony magazine that she did not do very well on an SAT exam, which is used for applying to colleges. However, she also recalled, "I remember thinking that the odd thing about it was that [the counselor] had not bothered to check my record. I was a straight-A student in all advanced courses.… I was a figure skater and a piano student. That none of that occurred to her I think was a [quiet] form of racism. It was the problem of low expectations [for African Americans]." In 1990 an unfortunate public incident occurred at the San Francisco airport. Rice was with a group of representatives from the Soviet Union. She was wearing the correct White House identification, yet a security person ordered her to stand behind the security lines. When she tried to explain that she was with the group, he shoved her. Newspapers made a big deal of the event. They wondered if the security person was being racist. Rice, however, told Ebony magazine that she did not feel any racial anger from him, "just that he was rude." Rice has also come across her share of sexism (a dislike or disrespect of someone solely because of his or her gender). When people say sexist things to her, she has said she sometimes responds by talking about other powerful women. "Haven't they heard of [former prime minister of England] Margaret Thatcher, [former prime minister of India] Indira Gandhi, or Cleopatra [the Queen of Egypt] for that matter?" she said to Jet magazine. She told Ebony magazine that sexism "usually comes in the line of 'How'd you end up doing this?" Rice's most successful weapon against racism and sexism has been her own intelligence and ability. "Condoleezza Rice." Contemporary Black Biography. Vol. 28. Detroit: Gale, 2001. "Condoleezza Rice." Notable Black American Women, Book 2. Edited by Jessie Carney Smith. Detroit: Gale, 1996. Felix, Antonia. Condi: The Condoleezza Rice Story. New York: Newmarket Press, 2002.